It's funny. Yesterday for Hennesy X.O., executive creative director Alexander Kalchev of DDB Paris critiqued the premium spirits sector for its "clichés of success" and "dusty heritage stories." Now, Stella Artois may not be premium (despite the chalice), but what we've got here is a play on both the success cliché and the heritage story—except that, far from dusty, it's energetic and super-fun. "Be Legacy," a campaign that kicked off last week, will explore different moments of the Belgian beer brand's history. Its opening spot, directed by François Rousselet, recounts the little-known story of Sébastien Artois, its founder. Don't expect any period-era hemming and hawing, though. The music is rock 'n' roll, and our young hero first appears giving a barrel full of hops a good, long sniff in a bustling 18th-century market. "I am Sébastien Artois. Brewmaster. Risk taker," Artois begins valiantly. 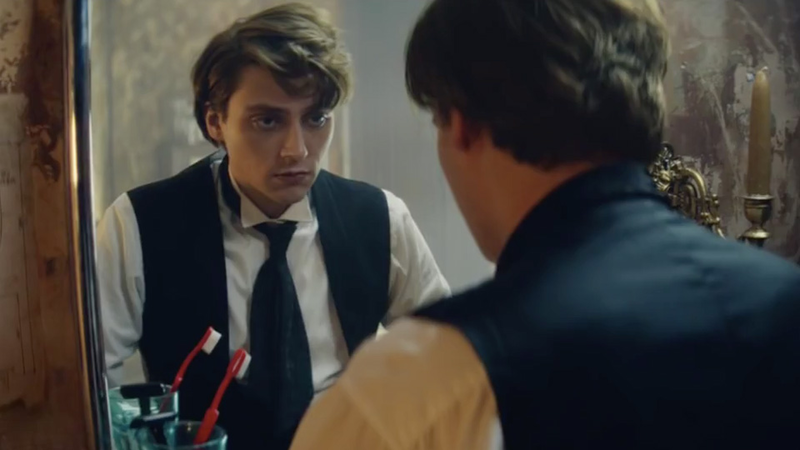 The weirdness for which Stella Artois is known is muted, but nonetheless present: As he says this, sleepily facing a bathroom mirror (featuring a modern red toothbrush), his reflection leaps out of the frame, grabs his lapels and shouts, "Wake up, Sébastien!" The narration is sparing, relying more on the actor's energy and less on heritage loyalty, exempting it from Kalchev's damning criticism of alcohol's boring self-importance (though beer is generally less lofty in its messaging than premium spirits are). Basically, Séb finds out there's a brewery for sale and spends most of the spot selling all his worldly belongings (including his dog) to acquire it, starting the brand best known for giving us ads like "Pirate Paper Boat,"—which, like this one, was created by Mother London. What's great is that there's plenty to see, which will inspire multiple viewings by beer (or just ad) geeks—the red toothbrush, sure; a retro TV set (part of what he sells off a huge carriage); a record shop with a neon sign; and even Van Gogh's "Sunflowers," which didn't exist until nearly 200 years after Sébastien Artois became head brewer at Den Hoorn brewery in 1708 (he would give it his name in 1717). Earlier this year, Stella Artois unveiled an impressive zoetrope made of its signature chalices for "Buy a Lady a Drink," an effort to raise money for clean water alongside Water.org. The earnest work highlighted both Stella's values and its more elaborate, artistic qualities (also characteristic of its messaging), but it's nice to see it return to the kind of storytelling it does best—a cross somewhere between a BBC period series and "Drunk History."